UAW Local 724 was chartered by the UAW International Union in 1940 by Federal Drop Forge-Federal Division and Melling Forging as the two charter Units. Although the records are not entirely clear it appears as though the local has been located at least four different places in the Lansing area. Before the current location at 450 Clare Street, the membership met in locations on South Street near South Washington Avenue, near the site of the Sir Pizza on Cedar and Mt. Hope and the last location before our current location at 111 W. St. Joseph. The official date of occupying 450 Clare Street was on January 1, 1957. Noteworthy items are that the St. Joseph location was purchased from UAW Local 602 in December 1952. The Clare Street venue was previously the union hall for UAW Local 652. UAW Local 724 is an Amalgamated UAW Local, meaning that the local has more than one worksite and represents more than one company. 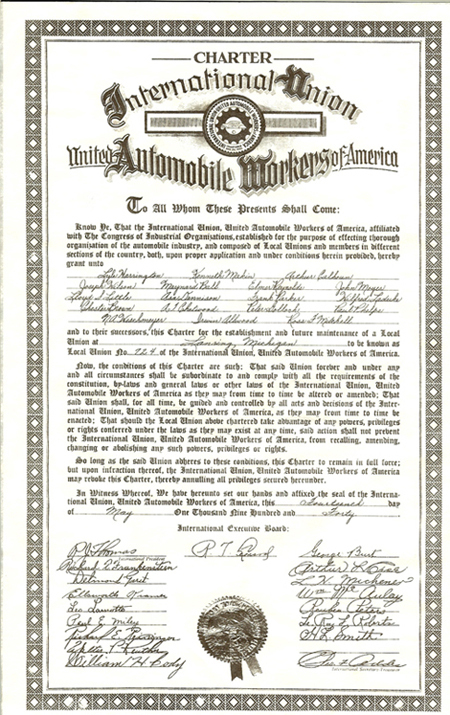 Currently, the Local has 14 different units or worksites organized by the UAW. They are Alliance Interiors, Bharat Forge, Bridgewater Interiors, Dakkota, Delta Dental, Dimondale Nursing Care Center, Dr. Pepper/7-UP, Huntsman, Industrial Metal Products (IMPCO), JLL-Drayton, JLL-Team, Lear-Mason, Regional Steel Distribution Center (RSDC), and Woodbridge. The Delta Dental & Dimondale Units are in the Technical, Office, & Professional (TOP) sector of the UAW. The rest of the units, are in the Independent Parts & Suppliers (IPS) sector of your union. Its heritage began as a “Drop Forge Local” that involved heating steel and “hammering” forged parts for all varieties of applications. In its heyday, Lansing was the Drop Forge capital of the world. With members at Atlas Drop Forge, Federal Forge, Lansing Drop Forge, Lindell Drop Forge, and Melling Forging, these jobs were equal to or better than many other employment opportunities in the area. Generations of workers toiled in the forge industry providing the necessary components for many industries. As foreign competition, cheap steel, and new technology entered into this industry, the jobs began to disappear. As we look at the forging presence today within Local 724 only Bharat Forge, formerly Federal Forge still operates today. Although these Units no longer exist, they were the cornerstone from which UAW Local 724 was built and continues to flourish today. We owe a debt of gratitude for their blood, sweat and tears. Since then the Local has represented a more diverse number of worksites and/or units with an increased emphasis on organizing and assisting workers. Since 1999, the Lear-Mason, RSDC, Dakkota, Woodbridge, the Dimondale Nursing Care Center, Dr.Pepper/7-UP, Bridgewater Interiors, JLL-Drayton, Jll-Teams, Alliance Interiors units have become part of the Amalgamated Local 724 family. As late as 1999, the membership stood at approximately 700 members. But with the increased organizing since 1999 we are at approximately 1,500 members, with a goal of more to follow.